Hoskins Interior Design will be celebrating 20 years of creating beautiful custom spaces for our clients on January 1, 2018. Deanna launched our firm in early 1998 and Kathy, Deanna’s daughter-in-law, joined later that year. Now, after a 40 + year distinguished career, Deanna is passing the torch to the next generation. Kathy has taken over the helm of the firm, and while this transition in ownership will bring some changes, the underlying philosophy of serving our clients will remain the same. With change comes excitement and creativity, and we look forward to seeing how our firm evolves over the next decade. However, the quality design and service you have come to expect from Hoskins Interior design will not change. We are still committed to creating personalized spaces for our clients, focused on functionality, comfort and style. Please let us know if you have any questions about our plans. And keep an eye out for an Open House for our new space in spring 2018! When clients first encounter the Hoskins Interior Design Team, they assume that Kathy and Deanna Hoskins are mother and daughter. However, Kathy Hoskins first joined another Hoskins Team by marrying Deanna’s son! Kathy and Deanna consider themselves lucky they do not have the stereotypical in-law relationship – and that their talents lie in the same arena. Not only do they have a happy family, they’ve also created a flourishing interior design firm. A native of the northwest side of Indianapolis, Kathy knew she wanted to be an interior designer from the age of 12. “I grew up in a beautiful small ranch home,” said Kathy. “My parents involved a designer in their decorating. When we moved to a larger house when I was 12, I attended all of the meetings with the designer because I was interested.” Kathy began her secondary education as a business major with a minor in interior design at Indiana University. Her passion for design won out however, and she ended up graduating with a degree in Interior Design. 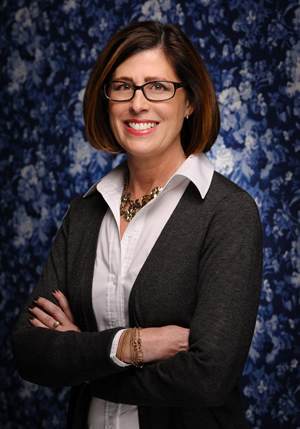 Kathy began her career in commercial interior design, which led her into the health care world. She thoroughly enjoyed using her love of interior design to help people. However, when Deanna opened her firm in 1998, Kathy saw a unique opportunity to learn more about residential design. She is now able to apply her valuable knowledge of structure, space and function to residential projects. Defining a design concept at the beginning of the process is a key factor in Kathy’s approach to a project. She guides her clients down a path of self-discovery, helping them tease out their needs and desires for their home. Once the concept is defined, clients are better able to make decisions on layout, flow, style, materials, and finishings. By keeping her clients focused on their goals, they end up with a space that works for them. Renovations and new construction projects are Kathy’s true passion. She views these projects as an opportunity to develop or enhance the character of a space to truly reflect its owner. New construction offers the chance to start from scratch, setting the tone for a home from the beginning. In terms of remodeling, Kathy believes every project should improve the character of a home. Regardless of the project type, tailoring every design detail to the personality of her clients allows her to create a beautiful and comfortable home. Diversity within a team is an enviable trait. Through the partnership between Kathy and Deanna, along with their staff, Hoskins Interior Design offers their clients comprehensive design services. Beyond combining form, function and aesthetic, the Hoskins Design Team takes the time to understand the unique nature within each of their clients. Discover how they can transform your home by scheduling a complimentary in-home consultation. Send an email or call 317-253-8986.